We are no strangers to small space living in our home. Our house is an older cape cod, which we love dearly with all its quirks and “New England charm,” as they call it here. But that means we have smaller closets and rooms than your average home. When we first saw the house, it was empty, so we didn’t even realize how small it was until we added all of our furniture and belongings. For example, our living room is 11 by 11 feet, and definitely on the smaller side especially considering it’s the most used room in our house. So it’s super important that we utilize every square inch of space, while at the same time not make the room feel cluttered and cramped. So I have become quite adept at finding and making space where there appears to be none! 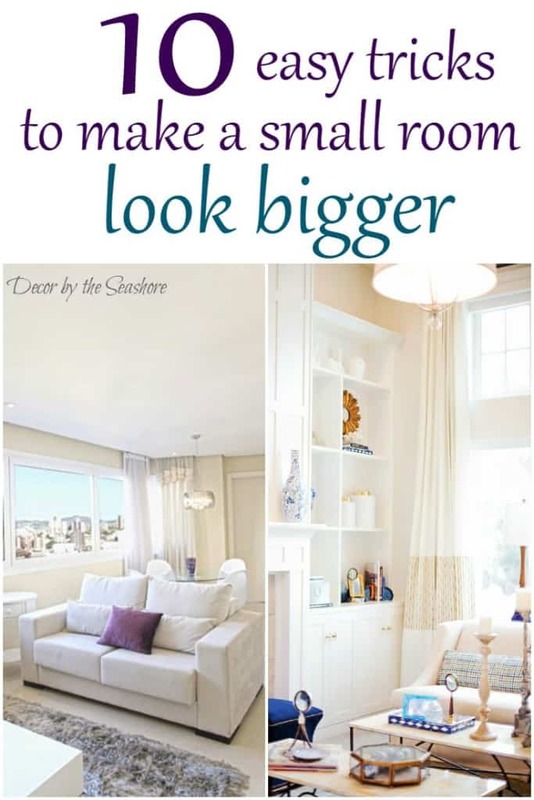 Check out my tips and tricks to help to make a room look and feel larger no matter how small it really is. 1. Declutter the room. This is the MOST important thing you can do to make your space look larger! I can’t tell you how much more open a room looks when it’s been through a good decluttering. Get rid of things you don’t use or need. There’s no reason to have 100 different books, magazines, toys, and knick knacks sitting around taking up space. Choose a few favorites to keep, and get rid of the rest. Unnecessary clutter can make a room feel small and cramped and make it harder to navigate around. 2. Select light colors. Lighter colors reflect light, making a room feel brighter and larger, while darker colors absorb light and make a room feel smaller and closed in. Choose light colors for larger items like the walls, floors, and curtains so that the room will feel more open and airy. 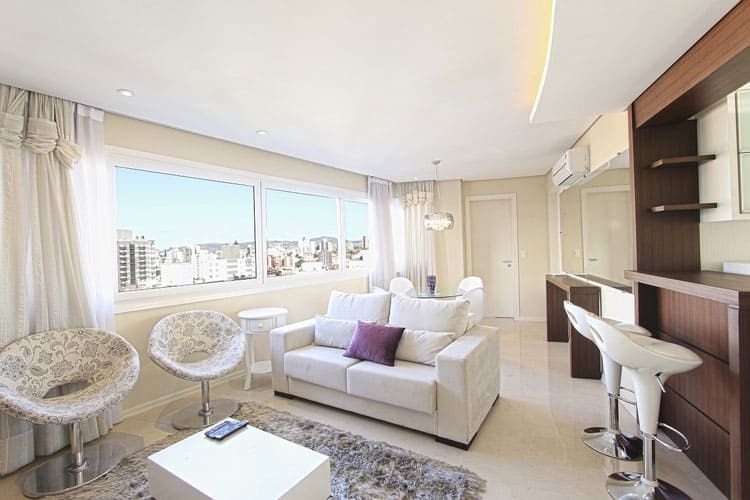 Neutrals, pastels, and lighter colors make a room feel larger and more spacious. 3. Rearrange furniture. 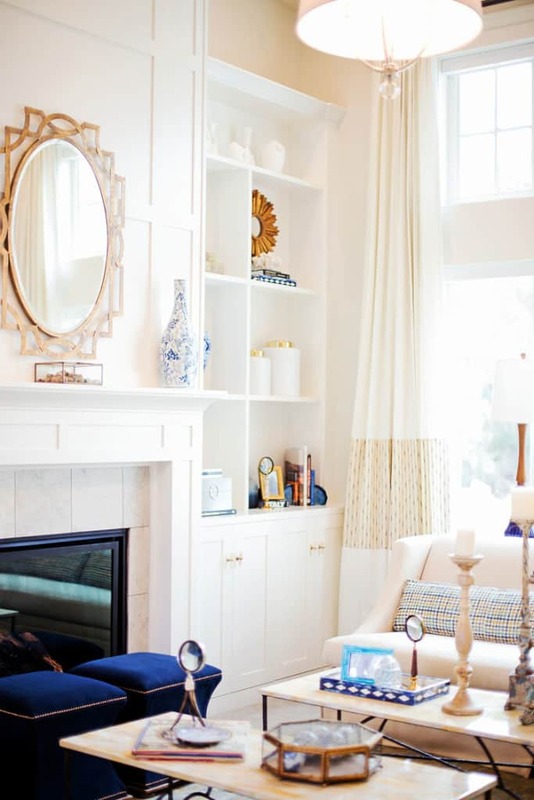 You might find that by rearranging your furniture into a different layout, you end up with more space, open the room up, and make it easier to navigate. If there’s a piece of furniture in your room that doesn’t get much use, consider removing it to free up some space. 4. Let the light in. If you have large windows in your room, don’t cover them up with dark, heavy curtains or blinds. Open them up and let all that natural light in! Follow this easy trick when you’re hanging curtains and hang your curtains higher and wider to make the windows look larger. It really draws the eyes upwards, making the room appear larger and taller. Or you could even forego window treatments altogether for a really open, fresh look. 5. Decorate selectively. A room doesn’t need to be covered in pictures, books, and knick knacks for it to feel decorated. A few tasteful decorations can help you add personal style and infuse a bit of color into your space. Some brightly colored objects that really pop are all you really need to make a statement. 6. Look for furniture that serves more than one purpose. Think outside the box. Just because a piece of furniture is marketed as one thing doesn’t mean it can’t be used for something else. A bookshelf can double as a TV stand, an ottoman can be used as seating and a side table, etc. Furniture with hidden storage is also good because it helps to keep your home organized and clutter out of sight! 7. Choose an appropriate rug. An area rug that is too small for a room can make the room feel much smaller. 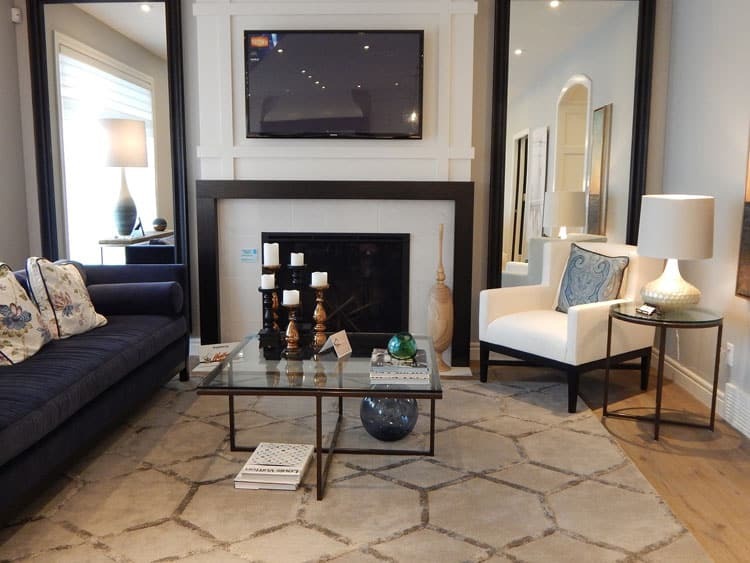 Ideally, the rug should at least be large enough that you can place the front feet of the furniture on it, such as couches or chairs. A nicely sized area rug allows the eyes go from end to end of the entire room, which makes the room feel much larger. 8. Use mirrors. Mirrors reflect light and images, which can make a small room look bigger, especially if they’re placed in the right spot. Mirrors not only make a room feel larger, but they give the room more depth and can also double as a beautiful decoration. 9. Measure before buying furniture. That over-sized couch might look perfect inside a large store showroom, but when you bring it home you find it’s taking up half your living room! Save yourself the money and heartache, and measure first to make sure before you buy anything that it will fit in your space. Look for furniture that has a smaller profile to save space. 10. Add legs to your furniture. By lifting furniture off of the ground, it makes the room feel more open and airy than when furniture is sitting flat on its bottom. Check out this tutorial to see how you can easily add legs to your own furniture. How do you make your small room look bigger? Do you have any other tips or tricks to add to the list? Let me know in the comments! And be sure to subscribe to my newsletter below so that you can receive my weekly newsletter full of fun DIY home decor ideas, craft tutorials, and free printables! I always need tips like these! I’m not great at decorating, and most of the rooms in our home are fairly small. I had no idea about the rug… I would have assumed that a smaller room meant a smaller rug! But it makes sense that you’d want your eyes to travel the length of the room…even if it is a small length. You have definitely made the most of your small space! Sharing this. Thanks, Jamie! So glad you got some ideas to help you make good use of your room no matter the size! I know, it can be so much easier just to buy a small rug and be done with it, but getting one that actually fits the whole room makes such a bigger statement and is well worth it in the end! All great tips Celeste. The rooms in my house are also on the small side. I really like photo #5 that was one that I had never considered and it makes quite a statement. Just adding a few pieces with great impact! Thanks, Mary! It’s so true, less is definitely more when it comes to decorating! Just a few statement pieces can really make a room look lovely without cluttering it up and making it feel smaller! We also have a small living area, small houses are quite common here in the Nederlands. I know where you are coming from when trying to decorate – it can certainly be a challenge. You have a beautiful home and you have given some great tips – thanks! Thanks so much, Sam! I know it can be somewhat difficult when you have to fit your life into a small home, but I really love ours and wouldn’t trade it for anything! All of these tips are excellent, and getting rid of clutter is definitely #1. We recently moved into a 1950s house, which I love, but the spaces are much smaller than our last home and storage is very limited. Clutter is my nemesis, and my constant battle. Oh, and this goes with tips #10, but we got a bed frame that doesn’t need a box spring, so it’s up off the ground, and it really made the room feel bigger. And I love all of the rooms in your photographs. They’re gorgeous! I know, Rebecca, the clutter is the hardest part, but it really makes a world of a difference once it’s cleared out! Our house was also built in the 50s, and the hardest part for me has been the lack of closet space, so we are learning how to deal with that and really pare down all our “stuff.” So glad you’ve found a solution for your bed! I am working on ours as well. These are great tips! I’m always amazed at how much bigger rooms look with legs on the furniture and mirrors! Who knew such tiny changes could have such a dramatic impact? Too true, Christine! Just working on changing a few little things can really change a room. All those little changes add up and create a big impact! This is so wonderful! I live in a very, very small home and these tips are to helpful! Thank you for sharing! Thanks, Morgan! I hope you’re able to put some of these tips to good use in your home! Thanks, Marty! Downsizing is always difficult, isn’t it? We also have some over-sized furniture pieces, and I can’t wait until we can switch them out for something more appropriate to our house! Measure before before buying furniture is a very important factor not many people remember to do this and they end up with pieces that look like monsters in their small spaces or something too small that doesn’t make the most use out of their small space! So true, Carmen! I keep our room measurements in an app on my phone so no matter where I am I’ll have them and not have to wonder if something is too big or too small for our space! Mirrors and furniture legs are always my go to for a small room. Thanks for sharing at the Creative Muster. It’s such an easy way to create a space that feels larger, isn’t it Robin? So glad you found this helpful! 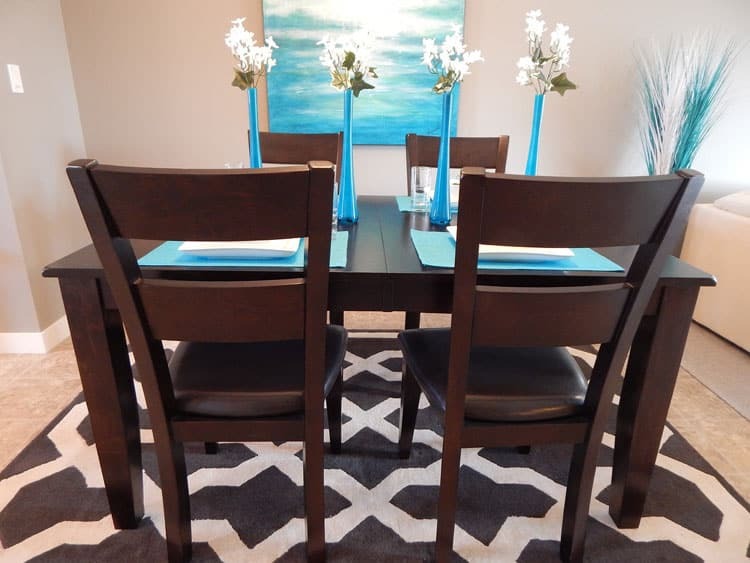 Love your gorgeous rooms, Celeste, and your ideas on how to make a small space look bigger. I’ll be featuring your tips tonight at Best of the Weekend! Thank you so much for linking up with us! Thank you so much, Amy! I’m so honored that you selected me for your feature! I always enjoy linking up with you all! How ’bout tips for a tiny bathroom with no windows? Lol! We live in a VERY old home, and the house is pretty large, but the rooms are small…especially the bathrooms. In the master bath there are two mirrors facing one another, and I do think it opens that one up a bit…great tip! In the other, the only place to put any more mirrors would be in the shower, and I AIN’T going THERE! LOL! Oh my, I know how tight those small bathrooms can be! We have one of those as well. I definitely recommend lighter colors in a tiny bathroom, especially one with no windows. Using similar colors for the walls, ceiling, and floor can help the colors blend together for one cohesive look, and then you can use towels for a pop of color if you want. Try to get rid of anything in there that you don’t use on a daily basis, such as random toiletries, etc. The one good thing (IMO) about small bathrooms is that they take less time to clean! Hope that helps! Good luck! These are great tips! Getting rid of clutter makes a huge difference! Thanks, Anne! So true, decluttering is one of the BEST and easiest ways to make a room seem more spacious and open! I love the rug tip! I have used mirrors and furniture that doubles as storage before, very helpful! Thanks Erin! Furniture with storage is essential, especially if you have a big family living in a small space! I love these tips and that room is just gorgeous, light, airy and beautiful. Thanks for sharing with Small Victories Sunday Linkup. Pinned to our linkup board. Thanks so much! It is a very beautiful room! Thanks for sharing this informative post. All the tips you have mentioned in this post are very useful. I really like the one tip most look for furniture that serves more than one purpose…….keep posting! I want to make my living room look bigger by adding the carpet in the centre of the room. I’ll get it big enough to place front couch legs on it and it’ll be a light coloured one. The drapes are ceiling to floor and wall to wall. The pattern on the drapes are tiny squares consisting only of 2 shades of gold. Couch is big and dark brown. Across from the couch is a huge dark fire place tv stand. Do I stay away from a patterned carpet? I was thinking perhaps a short shag type carpet. Would that work? What are your suggestions? Yeah! Great topic to choose thanks for providing information on this topic. All the tips are incredible that you have mentioned in this post. I really like the one tip most the use of Mirrors. I surely gonna use this tip into my home. Thanks for sharing such a great post.